Written on 11/7/2014 as a personal facebook post. I got so much feedback on it I decided to add some photos. Today I put up the driveway markers for snow plowing, emptied the kitty litter out by the fruit trees to discourage the mousies, spread the ashes lightly around the garden, took out the compost, brought in the last of the pumpkins from the greenhouse and the little fairy from the garden, fed the birds, tucked some bins and posts into the greenhouse, and added more corn stalks on top of the parsnips to hold the straw down. The boys moved the water jugs around the grapes and blueberries for extra protection, and filled the wood racks. Tonight I froze celery and made pumpkin leather. If this winter is anything like last winter, the neighbor who does our plowing will need these to tell where the driveway is between the drifts. You can see how deep it got in the post, “The Long Winter“. The parsnip patch. First, the parsnips are covered in straw or leaves. Then I put corn stalks over the top of the straw to keep it from blowing away. 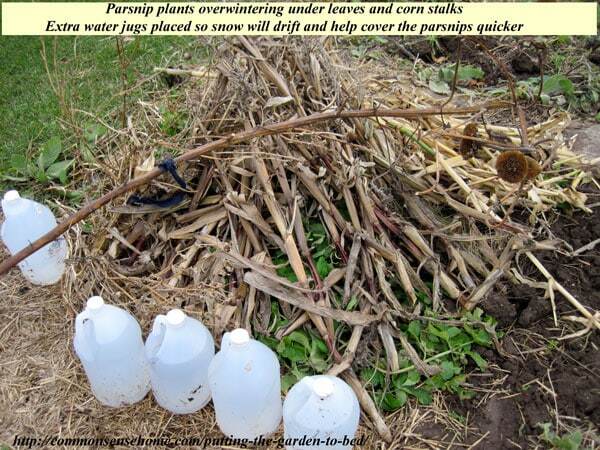 The water filled jugs are added to catch snow (along with the cornstalks) and protect the plants even more. 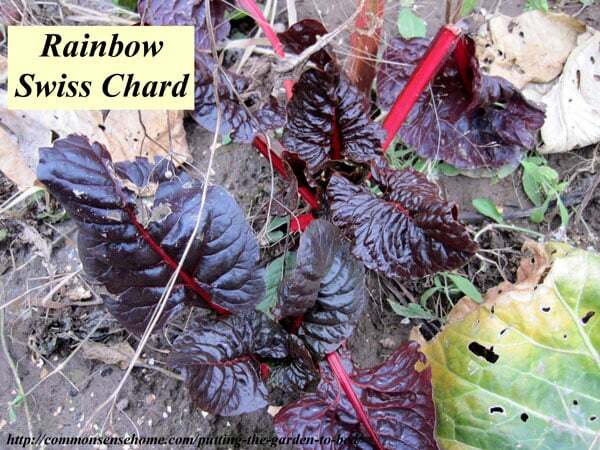 In spring these will be one of the first crops harvested from the garden. It's interesting to me how my perspective on the garden has changed over the years. I'm sure my garden looks like a mess to the average passerby, as all the neighbor's gardens are neatly plowed for spring. But when I walk outside, I see flocks of birdies hanging from the seedheads (wild and tame), foraging the abundant harvest. I know that if I wanted to, I could nibble right along with them, for many weed seeds are edible to humans, too. I have a bucket of plantain seeds waiting by the door to be stripped off their stems and stored for cooking. A few stray huckelberries hide here and there in the wildness. There are still fresh herbs that could be harvested for tea. 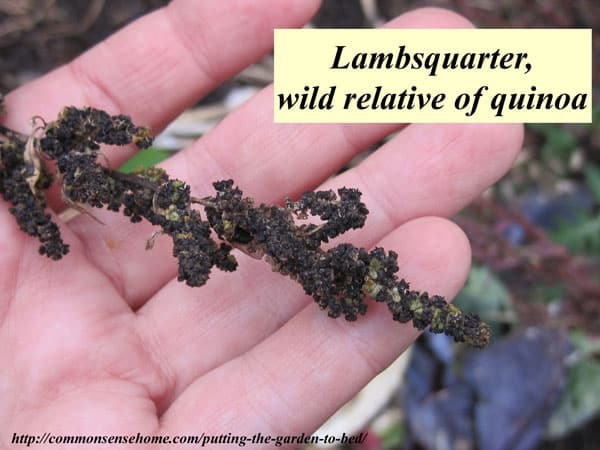 Lambsquarter, wild relative of the popular quinoa. Seeds can be ground for a cereal grain, or sprouted for use as sprouts or microgreens. Chocolate mint plant, still green, tasty and ready to harvest. 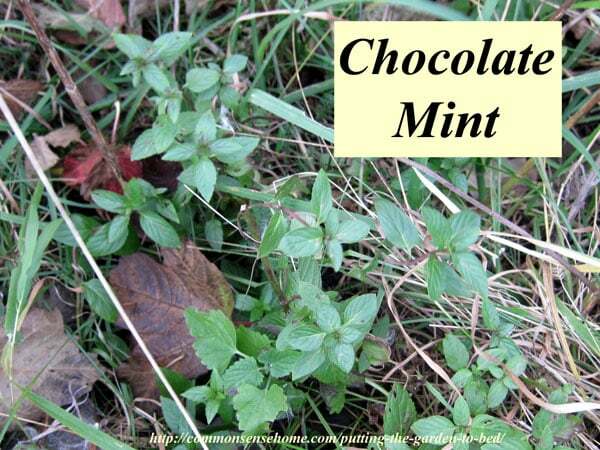 It makes a wonderful herbal tea, and tasty chocolate mint extract. Hardy greens, wild and tame, are still standing in the cold. Kale, chard, spinach, cabbage (new heads sprouting), mallow, plantain, thistle – all still firm and green. The cold mellows out the flavor. I munched while I was working. Harvest now continues well past hard frost. There's more food than most people realize if you just know what to look for and are willing to try new things. 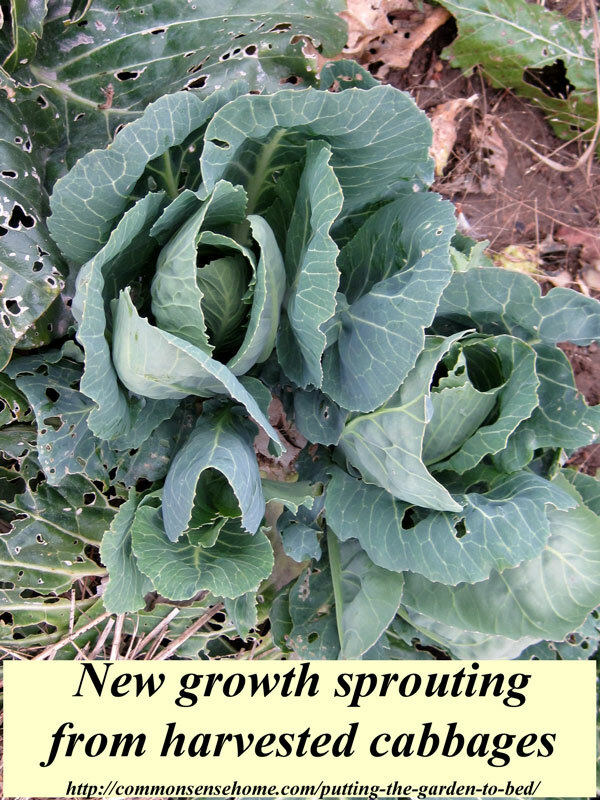 Cabbage sprouting from plants that have already been harvested. The new heads are tender and delicious. 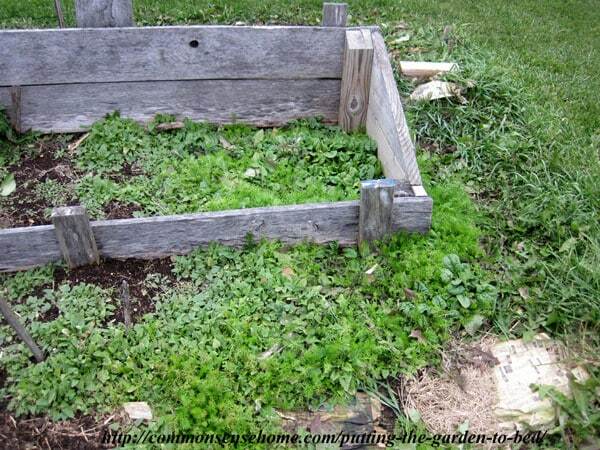 Volunteer spinach, strawberry spinach and chamomile. 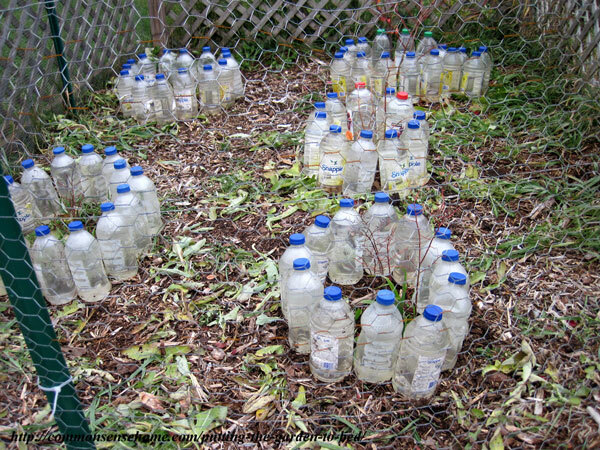 These will hold up to some cold, and new plants will likely emerge in the spring. If I pull back mulch and look under the dead plants, it's so alive! All the little critters don't need to dig super deep into the soil or relocate. Yes, sometimes the troublemakers overwinter along with the good guys, but there are generally enough good guys to keep them in line. Which brings me to the conclusion of my rambling – today I am grateful for this crazy abundance, and the eyes and knowledge to see what's been in front of me much of my life that many people never notice. The plants, wild and tame, that are like old friends to me now. 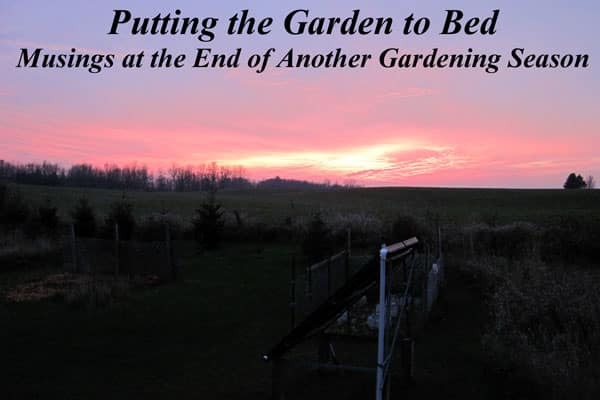 What does “Putting the Garden to Bed” mean? 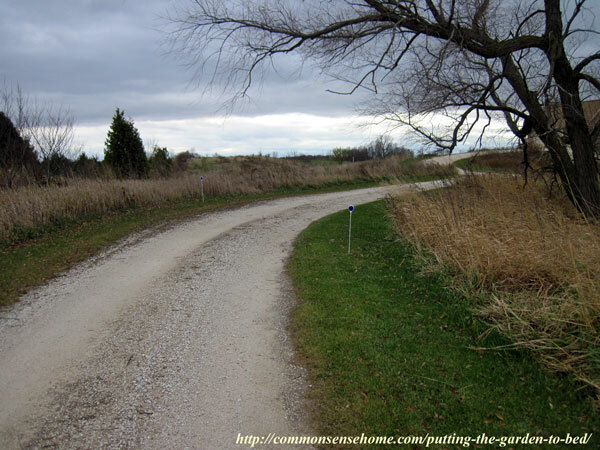 My friend, Amanda, who helps me out with social media for the site and is new-ish to homesteading, asked me what I meant when I talked about “putting the garden to bed”. I don't have a set routine, that's just the term I use to refer to all the odds and ends that get done to wrap up another harvest season. All the trellises and fences are carefully taken down and stored for use again next year. The garlic and parsnips are mulched to protect them from the winter cold. Every young tree and small shrub is fenced or wrapped (or both) to protect them from deer and rodents. Items that will be damaged by the cold and snow are also brought in, like hoses, rain gauges, garden ornaments and the like. Any landscaping fabric that was used to provide extra warmth to heat loving garden plants is pulled up, cleaned and stored for reuse. Sometimes I cut down cornstalks and wild grape vines and use them for seasonal decorations. We keep harvesting and preserving until the garden is buried under snow. Even then, some things like wild seed heads are still available. Many crops that are brought inside when hard frost threatens are processed further, into things like kraut and fruit leathers, or canned, dried or frozen for even longer storage. Right now I still have ground cherries and tomatillos rustling around my counter, as well as a few large zucchini and a few hot peppers. There are seed heads from plantain and amaranth waiting in bins. I bring them into dry so they shed their seeds more easily. We're going to try popping the amaranth seeds this year. They're supposed to pop up like miniature popcorn. I'm tincturing wild roots from dandelion, burdock and yellow dock to use for medicine. Sometime in the next couple of months, I'll go through my seed inventory and decide what I need for next year, and in February I'll start planting things like onion seeds that need a long time to grow. A few herb and flower seeds germinate better after time in the deep freeze, so that needs to be accounted for as well. We're working on adding more trees and shrubs to our permaculture plantings, so I'll need to talk to my husband and boys about what gets planted next, and how much we can reasonably add in one season. How does your garden grow? I'd love to hear from you! I love it! Thank you for writing this. I am new to homesteading and gardening. I grew up trying to grow plants indoors and always failed miserably. I can kill ivy like no one’s business. After both my son’s health issues and husband’s well and now mine we have been making small changes over the last year and a half (most thanks to you and your website) and I’ve been some what successful. Looking forward to more. Thank you for all you have done for so many of us. Thanks, Amanda, for always cheering me on, even when I get frustrated and tired. Thank you for taking the time and keeping people informed! We all Love you!! Interesting idea to use waterjugs for winter protection. I never thought of that. It’s the most helpful in springtime, when the seedlings are small and get so battered by our winds. This time of year they mainly turn into snow catchers, and the snow does the insulating. Nice of you to stop by. I enjoyed your webpage. I clean my garden, removing rainbarrel, empty, put my garlic for next year coming to end. My garden is now resting. my chocolate mint is still growing inspite of the weather conditions. We are having snow as I am in kitchener, canada. I cut my two pumpkins, remove seeds and am baking the pumpkin so that I can use for pumpkin bars, soups etc and seeds I will bake after the pumpkin so that we can enjoy during xmas time in basement with my wood fire and enjoy the xmas seasons. I have my homestead last 14 years. I eat from my garden. Do canning,freezing etc. Best xmas to you all. I have never even heard of lambs-quarter. This article is just chock full of good information. It’s also known as goosefoot, and is one of the easiest to identify and tastiest wild greens around. It makes a great spinach substitute. You can read more about it in Weekly Weeder #21 and I use it in a recipe called Goosefoot Pie, which is like a mock spanikopita. Lamb’s quarters….hmmmm…we must have this, here in Vermont, and I must have seen it but didn’t recognize it for the (obviously valuable) plant that it is! You can bet that I’ll be watching it for it in the Spring 🙂 (Along with the ramps and the cress and all the other wonderful things I find in the wild) Thank you so much for this site. I visit regularly and even though we are geographically quite a distance apart, we have a lot of things in common – including gardening, preserving and climate. You’re awesome!